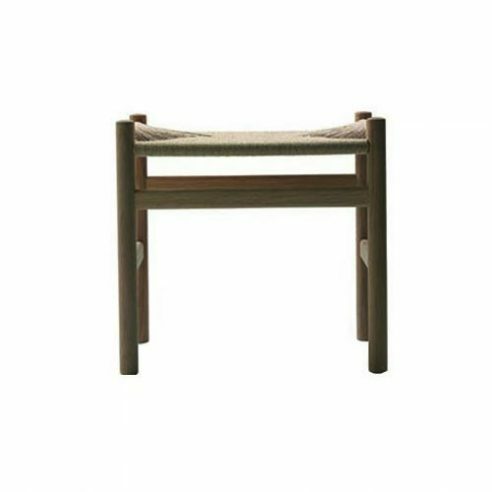 Designed by Hans J. Wegner in 1966, footstool CH53 has the same ascetic expression evident in the easy chair CH44 he had designed for Carl Hansen the previous year and the two designs compliment each other perfectly. In common with his earlier design J16s for the FDB (Danish Co-operative Union) this stool by Wegner for Carl Hansen is also inspired by the aesthetically simple, self-produced furniture of the American Shaker community. While he was no doubt interested in these new materials and would probably have liked to investigate their possibilities more than he did, one of the reasons he didn’t was because he felt obliged to create new furniture designs each year for the marketing organization, Salesco which only marketed and sold Wegner’s furniture. In other words, he was needed elsewhere and there one worked in wood. furniture for Carl Hansen & Son throughout the 1960s. The Shaker, a religious sect in the United States, comprising of northern European immigrants had since the beginning of the 19th century have lived in small communities. Isolated from external influences the sect fostered a tradition of artisanship. Its members believed that the spiritual and temporal worlds meet in the things they build and surround themselves with. Therefore an object’s exterior must be modified as little as possible and be pure, unadorned and robust. It is for this same reason that an object’s function completely dictates its form. According to Shaker aesthetics, beauty is expressed in functionality. Wegner particularly found inspiration in the archetypal Shaker chair that consists of a slender – but strong – wooden frame with straight angles, a woven seat that is penetrated by the legs in the two front corners, and three or four wide transverse rails in the back.